Amidst conflict and humanitarian crisis in Syria, health workers are battling to end the current polio outbreak. Since the World Health Organization announced the outbreak on 8 June 2017, 70 cases have been confirmed, with 67 in Deir Ez-Zor governorate, two in Raqqa and one in Homs. WHO and UNICEF are supporting the Government of Syria and local authorities to end the outbreak. Two mass vaccination campaigns have taken place, thanks to dedicated health care workers on the ground, striving to reach resident, refugee and internally displaced children. 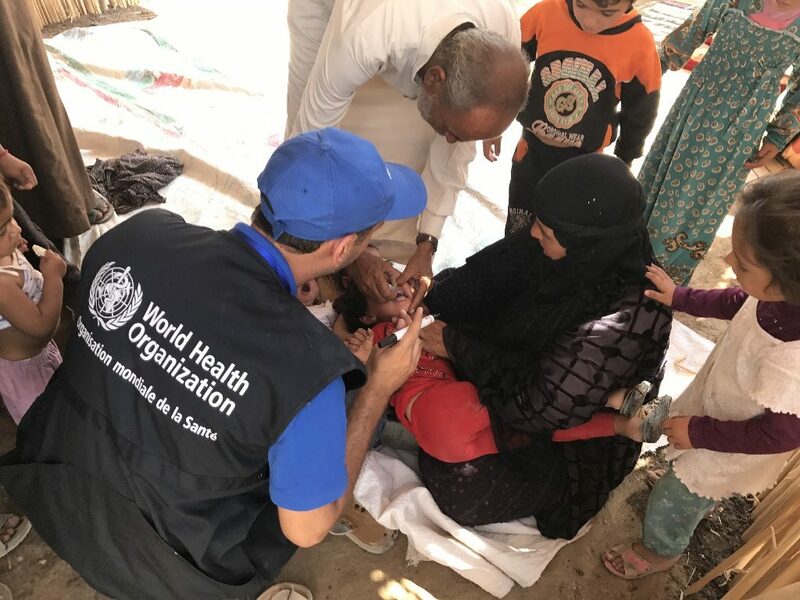 Despite the challenges of holding vaccination campaigns in a conflict zone and effectively reaching displaced populations from infected areas, more than 255,000 have been vaccinated in Deir Ez-Zor, and more than 140,000 in Raqqa. Contingency plans for an additional vaccination campaign are being put in place to reach children under the age of five with monovalent oral polio vaccine type 2 in the infected zones and areas hosting high risk populations, particularly recently displaced families from Deir Ez-Zor. Two different vaccines are being used to ensure that population immunity against polio is rapidly increased. The monovalent oral polio vaccine type 2 is being used to rapidly increase immunity against type 2 polio. To boost immunity against type 2 and also provide protection against types 1 and 3, the inactivated poliovirus vaccine is also being provided to children aged between 2 and 23 months in high risk areas. While all hands are on deck to stop polio, outbreak response teams are also working hard and adapting complementary strategies such as vaccination at transit points and registration centres for internally displaced persons from infected zones, to prevent spread of the virus to other parts of the country. The inactivated poliovirus vaccine is being used strategically in high risk areas, especially where there are high numbers of internally displaced families. In order to reduce the threat of polio spreading to the countries surrounding Syria, vaccination activities have been carried out in Iraq, Lebanon and Turkey. These activities are aiming to reach both Syrian children and those from local communities to limit the possibility for the virus to spread across international borders. Knowing where the virus is at all times is crucial to stop the outbreak. 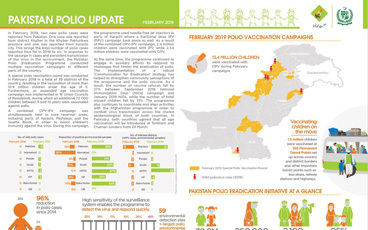 Surveillance is ongoing across the country, with doctors, community members and vaccinators on the alert for any child with potential symptoms of polio. The surveillance system is operating well, despite the challenges of transporting stool samples from children with symptoms to laboratories for testing. Plans are also in place to begin environmental surveillance in Syria by the end of the year. This will enable laboratories to identify the presence of polio in sewerage to provide early warning. The information from disease surveillance being used to inform where and when vaccination campaigns need to take place. The current outbreak in Syria is caused by circulating vaccine derived poliovirus type 2, a very rare virus that can occur when population immunity against polio is very low. In Syria, conflict and insecurity have compromised community access to immunization services, which has allowed the weakened virus in the oral polio vaccine to spread between under-immunized individuals and, over a long period of time, mutate into a virulent form that can cause paralysis. The only way to stop transmission of vaccine-derived poliovirus is with an immunization response, the same as with any outbreak of wild polio. With high levels of population immunity, the virus will no longer be able to survive and the outbreak will come to a close.